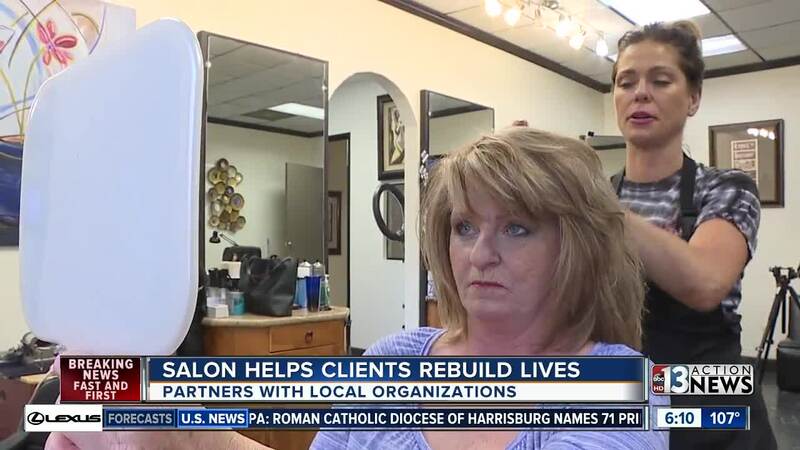 The Salon is helping its clients rebuild their lives. Many of the clients are former addicts or had other problems. The salon partners with local organizations to help people. One local salon is not just helping people who are struggling to look and feel good on the outside, but also on the inside. It's a different kind of therapy - one that empowers people like Zenith Bennett. "I was an addict, a meth addict... and marijuana for 30 years." 'The Salon' along Rainbow near Edna is open to all. But what makes it special, its clients include people in addiction recovery, served time in prison, and veterans. It is a full service salon so people who are struggling can get their hair, nails and makeup done at a discounted rate or even free of charge if you come in through their partner organizations. 'The Salon's' funding comes from contracts with different organizations and through regular paid-for services. "The self esteem was just an amazing boost and amazingly helpful too you know getting my sobriety," says Bennett. Through the help of Solutions Recovery Treatment Center, Zenith has been clean for almost 5 years now and a client of 'The Salon' since. Clients tell 13 Action News, there's an overwhelming sense of community every time they come. They don't feel the stigma or feel alone. Nicole Christie is the owner of 'The Salon'. "Everybody that works here has been in recovery or have a family member or a friend that has been in recovery or active addiction," says Christie. With every treatment, clients get to feel confident and beautiful outside and on the inside. "This is the first time I felt like this in 30 years," says Bennett.